The two-outlet D2000T is essentially the Zone 3 section of the six-outlet conditioners. The D2000T sits on the floor next to the power amplifier or equipment rack. To reiterate, the D2000T lacks the CCI filters of the other two conditioners, and is instead based on the QR/BB circuit. It offers 15dB of noise isolation between the input and output. The Denali’s AC outlets are a custom Shunyata design called CopperCONN. The outlet is built with large solid-copper contacts and conductors rather than with the thin copper-coated brass contacts of conventional outlets. The specific copper inside the Denali, the wiring, the AC outlets, and the noise-reduction technology are all designed by Shunyata and are proprietary. In addition, Shunyata treats the components in the Denali with a process it calls the “Kinetic Phase Inversion Process.” It is secretive about how this works, but claims that the process enables components and wiring to break in immediately, and more fully, than during normal use. Cryptic names for secret processes usually arouse suspicion, but Caelin Gabriel has earned the benefit of the doubt by virtue of his long track record of inventive technologies and outside-the-box thinking, and his scientific-minded approach, not to mention his products’ sonic performance over the years. I must commend Shunyata for its creativity in making the Denali products easier to integrate into a system than previous designs. The D6000T, with its tall and slim tower chassis, doesn’t require a rack shelf. Before switching to the Denali, I positioned the Triton facedown on the floor behind my full rack, an inelegant and ignoble placement that wasn’t ideal visually, ergonomically, or sonically. The D6000T, by contrast, sits next to my rack, consumes very little floor space, and allows me to run all the AC cords to the rack’s side, away from signal-carrying interconnects. The sloping front panel and graceful lines turn what is essentially a black box into an elegant-looking component. 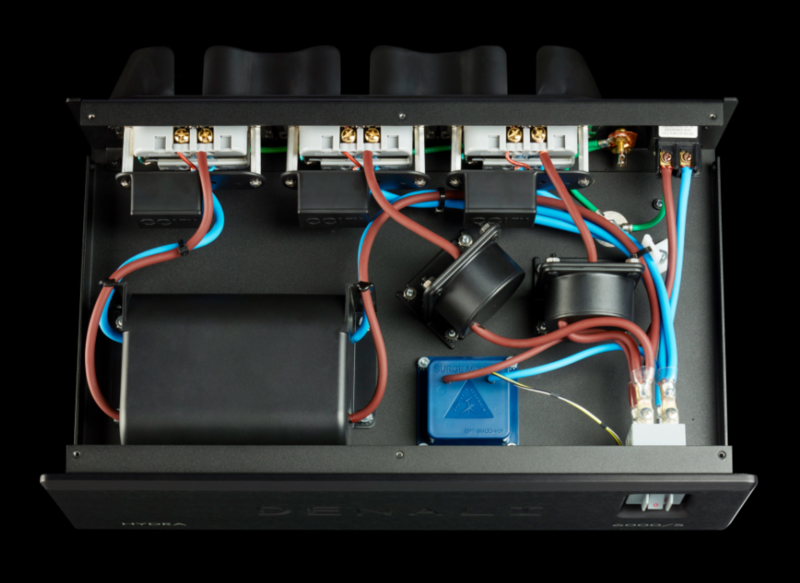 These comments also apply to the low-profile D2000T; one sat unobtrusively on each side of the Critical Mass Systems Maxxum amplifier stand. Another welcome innovation is the “cradle support system,” a simple yet highly effective way to secure the AC plugs in the Denali’s AC outlets. A semicircle above and beneath each duplex outlet, extending a few inches behind the rear panel, cradles the AC plug so that there’s virtually no weight pulling on the cable. The combination of Shunyata’s custom AC plug, the CopperCONN AC socket, and the cradle support system produces a very firm and secure connection. Although the Denali series is better technically, sonically (as we’ll soon see), and ergonomically than the Triton/Typhon, the new products cost no more than their predecessors. The only misstep in the new design is the retina-searing blue LED on the front panel; I covered it with a tiny circle of black electrical tape. Shunyata says that this problem has been corrected. I installed a Denali D6000T next to my rack, a D6000S behind my rack, and a pair of D2000Ts (one for each amplifier) along with Shunyata’s Sigma AC cords. This setup replaced a Triton, Shunyata’s DPC8 conditioner (the DPC8 is designed specifically for digital sources), and three Typhons (one connected to the Triton, the other two hanging on unused AC outlets). The replacement Denali system is about half the cost and half the weight and bulk of the previous Triton/Typhon setup. My listening room is supplied by four dedicated 20A circuits. One circuit powers the analog rack, one supplies the main rack housing the preamp and digital components, and each monoblock is on its own circuit. The AC wiring from the electrical sub-panel to the Shunyata-made wall outlets is a cryogenically treated in-wall wire developed by Audience. All the AC power cords are Shunyata Sigma, which contain miniature noise filters built right into the large carbon-fiber plug housing. Incidentally, when I had the dedicated lines installed I left in place the stock AC power to the listening room to allow A/B comparisons. Before describing how the Denali sounds in my system and the ways in which it differs from the Triton/Typhon, I’d like to dispel a common myth about AC power conditioning. It is widely assumed that an AC conditioner for an audio system is primarily focused on cleaning up the “dirty” incoming AC power. Although a good conditioner does remove noise on the incoming AC line, an equally important job is to isolate the components within your audio system from each other. This is especially important with today’s products that incorporate digital circuitry. It’s not just DACs, music servers, and other digital sources that generate digital noise; most modern preamplifiers, for example, are microprocessor-controlled. Any component with digital switching circuits puts noise back onto the AC line, which gets into the audio circuitry of other components plugged into the common AC line. A good AC conditioner isolates each component from every other component in your system.